Today’s fascination with alternate and virtual realities can sometimes feel entirely contemporary, firmly grounded in the technological innovations of the digital age. However, the desire for devices that alter our perception has a long—and dazzling—history. A “peep-show” is a visual tool that captivates viewers by creating an impression of highly illusionistic space. Utilizing a clever combination of form and function, peep-shows are made by layering a series of distinct yet complementary images. The result is a composite image that conveys a strong sense of perspectival depth. The card shown here is the first of a set of six that, when united, form a peep-show depicting a lively scene of Venice during Carnival. To assemble the peep-show, the cards are arranged in sequence, with one behind other. Like the other five in the set, this card thus presents only a portion of the overall composition, with blank areas cut away so as to reveal the images that lie behind. Once assembled, this peep-show offers an engaging view of the Piazzetta San Marco, seen from the Venetian Lagoon. Recognizable buildings flank the crowded scene, with the Doge’s Palace at right, the Biblioteca Marciana at left, and the clock-tower and Saint Mark’s Basilica visible in the distance beyond. The architectural setting establishes a coherent sense of perspectival depth, with the buildings growing consistently smaller as they recede back into the illusionistic space. Part of what makes a peep-show special, however, is that the buildings that appear to be farther from the viewer, are, in fact, just that: the card at the bottom of the stack depicts the buildings that are farthest away. The figures in the progressing panels likewise diminish in size as the frames recede, and have been meticulously placed so as to fill the gaps between the preceding figures. This extends the visual depth, an effect heightened by the fact that the figures understood to be farthest away are rendered in lesser detail, mimicking the common binocular perception of space. The peep-show was one of several inventions developed in the mid-eighteenth century that combined art and optical illusion to enliven circulated prints. These particular peep-show prints were published by Martin Engelbrecht, whose largely unrivaled Augsburg-based workshop produced over 5,000 works from 1719-1949. In the mid-eighteenth century, a market for printed materials depicting European cities, architecture, churches, and squares flourished in Augsburg. Englebrecht, born in the Bavarian city in 1684, capitalized on this interest by producing imaginative scenes set in far-flung places. 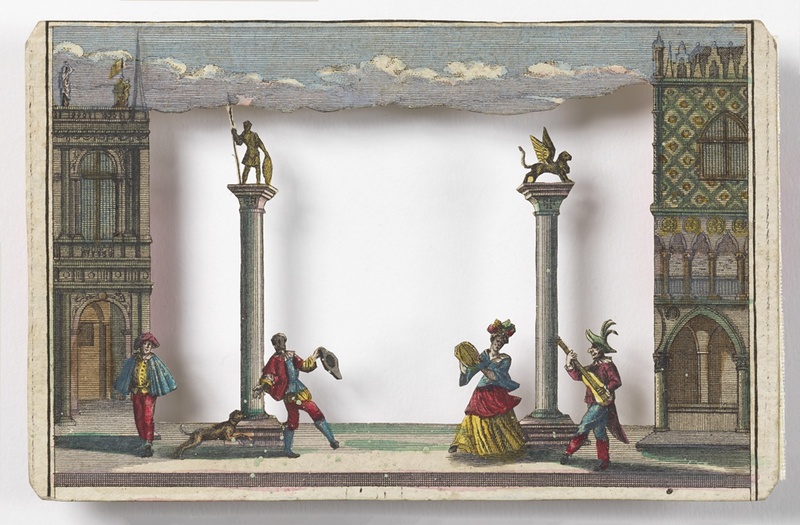 Engelbrecht’s fictive scenes “aim to recreate reality in a theatrical way,” and the theatricality of this Venetian scene may signal to a viewer the connection between the peep-show’s mechanisms of illusion and the period’s emerging trends in both optical attractions and stage designs. Theories of stage design and architecture made their way to Augsburg at this time, including those of Giuseppe Galli Bibbiena (1696-1757), who advocated an approach to stage design that relied on angular perspectives, with flanking walls meeting the edge of the stage at a diagonal, rather than perpendicularly. This theatrical concept seems to have influenced Engelbrecht’s peep-show depiction of Venice at Carnival. The Venetian facades act as orthogonal devices to draw the eye back into the receding space, allowing the viewer to feel as though she is within the scene, rather than outside of it. The front card, with its twin columns and ornate buildings, acts as a proscenium. The bright colors and carefully arranged figures on the front card evoke a choreographed and carefully styled production, while the crowds populating the receding scenes convey a lively manner, recalling the experience of wandering the streets of Venice during Carnival. Heightened by Engelbrecht’s tools of optical illusion, the scene is at once illustrative – depicting a place a viewer might never have been – and experiential – giving her a glimpse of Venetian landmarks, culture, and theatre, along with the reality-bending feeling of walking within a crowd of masked and foreign figures. Robinson, David. “Review: Augsburg Peepshows.” Print Quarterly 5, no. 2 (June 1988): 188-91. Accessed October 31, 2018. JSTOR. 190. Mir Finkelman is the Collections Assistant for Drawings, Prints & Graphic Design at Cooper Hewitt, Smithsonian Design Museum. While rehousing works on paper, she likes to listen to 90s vocal house.